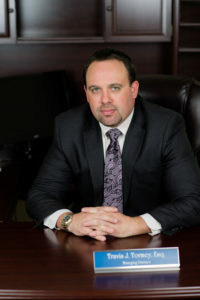 I am Travis J. Tormey, Esq., the founding attorney of the Tormey Law Firm LLC with offices in Hackensack, Morristown, and Newark NJ. I left two of the largest criminal defense law firms in the state to establish my own practice, primarily to provide the type of hands-on legal counsel that is not always attainable at a larger firm, as it churns through a high volume of cases. I was recently named one of the top ten criminal attorneys in the State of New Jersey by the American Jurist Institute. I have been recognized as one of the top 40 criminal defense attorneys in the country by the National Trial Lawyers association as well as the National Association of Criminal Defense Lawyers. I have been cited as a legal resource on domestic violence by the Daily Record, Star Ledger, Asbury Park Press, AOL News, and I have appeared as a guest on CBS Radio. I received the clients choice award for four straight years from AVVO.com (2013, 2014, 2015, 2016) and I have a perfect 10.0 rating. If you or a loved one is facing a permanent restraining order, we can help. My law firm focuses only on handling criminal and DWI cases in NJ including restraining orders. As a result, our lawyers have literally handled hundreds of restraining order cases in almost every county in NJ. Our results speak for themselves and our client reviews demonstrate the type of service we provide to individuals who trust us to protect their rights and their future. My restraining order team is composed of several former domestic violence prosecutors who used to prosecute domestic violence offenses for the State of New Jersey. Now, they use their experience, knowledge, and expertise to both prosecute and defend against temporary and final restraining order matters in New Jersey. Our attorneys are literally handled restraining order trials every week in almost every county in the State of New Jersey. I am available immediately to assist you as (908)-336-5008. The initial consultation is always provided free of charge.